This January, HBO bestowed a gift upon happy nerds everywhere: For the first time ever, every Harry Potter movie is available to stream on a single platform. Gone are the days of pesky physical media! No longer will marathons entail disc-swapping and dust removal! 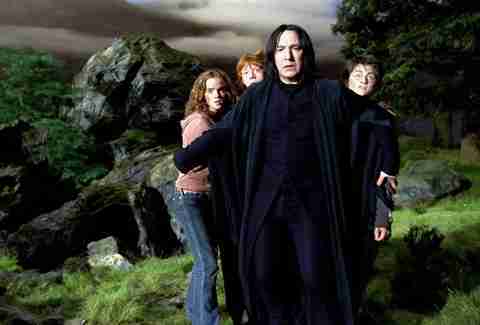 True Potter fans already own a copy of every installment on Blu-ray, but now we don’t have to move from the couch to hear Alan Rickman’s Snape snarl. To celebrate the occasion, we took full advantage of HBO’s Harry Potter collection by re-watching all of the films and ranking them accordingly. We tried to rank the films not just as personal favorites, but as both adaptations and cinematic experiences. Here’s where we landed. Deathly Hallows Pt. II isn’t a bad movie. It’s not even a bad Harry Potter movie. But the fracturing of Parts I and II prove detrimental for this installment, as it’s stifled by "single location syndrome." The Battle of Hogwarts is a major part of the seventh book, and the sheer magnitude of the event is worthy of the attention Pt. II gives it. But did it really need (almost) a whole movie? In an effort to fill its runtime, the back half draws out certain sequences to the point of ridiculousness. The book ends with a confrontation between Harry and Voldemort that is chilling in its formality: Harry undresses Voldemort with words, calling him “Tom” while every student and teacher in Hogwarts watches on, and kills him with a blunt simplicity that stands in contrast to the mystical villain the world expected him to be. But in the film, Harry chases Voldemort through Hogwarts in an increasingly goofy series of escapades that erodes the idea of Voldemort as the thing he fears most: a mortal man. Instead, he turns himself into ribbon, flies off a building, mind-melds with Harry, and eventually cracks apart and dissolves into the air like ash. It’s maybe a more cinematic sendoff, and there’s no need for slavish devotion to the book, but the sequence derails the last act, and the movie doesn’t have much else to stand on. It’s an epic conclusion, but an empty standalone. Fan consensus generally puts Chamber of Secrets in last place, which is understandable if a little unfair. The movie is a solid watch with a delicious central performance from Kenneth Branagh as Gilderoy Lockhart, and two excellent monsters in Aragog and the basilisk. But the big problem with Chamber -- and to a slightly lesser extent, Sorcerer's Stone -- is that director Chris Columbus is an American, with American sensibilities. The British quirkiness of the books is lost in translation, an issue that pops up in other Potter films but is most obvious here. The kids speak in a mannered, "movie kid" way, in a way that feels stiff and studio-ordered. Luckily, it's not a huge distraction, and there are other details to get excited about on a re-watch, like Hermione's Polyjuiced cat face and Lockhart's hilarious memory loss. And despite its glossy exterior, Chamber of Secrets is actually a pretty dark film considering it comes so early in the series. Ginny's possession, the petrification and near-death of a handful of students (including Hermione), "her skeleton will lie in the chamber forever" written in blood -- it's pretty heavy stuff for a kids' movie. Half-Blood Prince has some of the series' best moments, and the emotion of the last act -- from the cave sequence to Tom Felton's compelling development of Draco to Dumbledore's death -- is top-tier. But it's a gloomier movie than it needs to be considering Prince is one of the funniest Potter books. (It's also literally gloomier, opting for a muddy color palette that casts the film in ugly brown shadows.) With the exception of Harry drunk on Felix Felicis and Ron drunk on a love potion, the film is laboriously grim, with should-be humorous sequences like Hermione's canary attack on Ron coming off staid and bleak. The movie also fails at depicting believable teenage infatuation. Harry and Ginny's burgeoning love is laughably bad here, with a few moments so uncomfortable they're borderline unwatchable. Ron and Hermione dating horrible people to annoy one another and bury their feelings is also void of much emotion; Lavender Brown is excellently cast but badly used, and the Cormac McClaggen stuff is silly and weightless. This is the film to establish our endgame couples, and Prince really misses the mark. Toss in a befuddling mid-movie sequence where the Weasley house burns to the ground -- something never referenced again, with no consequence on character or plot -- and Half-Blood Prince starts unraveling. The first installment in the series is such a nostalgia fest that it almost transcends a traditional ranking. It's the most immediately knowable: lanterned boats on their way to a castle, a snowy owl on a young boy's shoulder, a slobbery three-headed dog, letters pouring in from a fireplace. Even non-Potter fans know the drill. Luckily, Sorcerer's Stone really holds up as an entry point to the series, even with dated special effects. Harry's introduction to the wizarding world is ours, too, and it comes with a wink and a hug. There's something magical about the small moments, like the Weasleys bustling through King's Cross, searching for a fractioned platform that shouldn't exist. Or Dumbledore chomping at jelly beans on the end of a hospital bed. 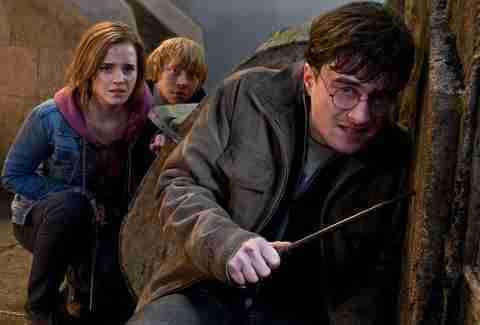 Or Hermione perfectly levitating a feather, her classmates looking on in awe. The plot may be the most childish of the series -- which, duh, it's about 11-year-olds -- but it's fun to be young again. 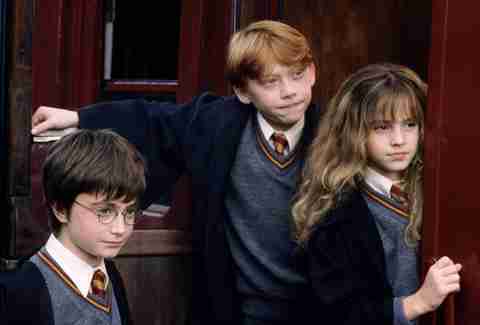 Sorcerer's Stone is still the real deal, even if lacks the pathos of the later films. Goblet of Fire is the cinematic centerpiece of the Potter universe, full of wizarding sports, dragons, mermaids, and mazes. The Triwizard Tournament is an excellent framing device, bringing in new characters like Fleur and Krum, and expanding the confines of the wizarding world. It's hard to find much to complain about with Goblet (except, perhaps, Michael Gambon's angry Dumbledore). Cedric's death is devastating, and the final graveyard sequence is bone-chilling, with some terrifying visuals. The acting, especially Brendan Gleeson's Mad-Eye Moody and David Tenant's Barty Crouch Jr., is top-notch. The special effects are spectacular, the dragons thrilling, and the Yule Ball -- while maybe a little long -- is a nice distraction from the busier goings on. It's always nice to see these kids as kids. And yet, it's hard to work up much passion for Goblet, which is largely divorced from the other films, until its finale. The Triwizard Tournament is fun, and the results of it are important to the story going forward, but a lot of it feels inconsequential, a step back after the introduction to Sirius and Lupin. It's an enjoyable movie, and an expertly directed one (Mike Newell brings a lovely British charm to some of the humor), but it doesn't feel as immediate as the others. It's still hard to believe Warner Bros. gave the Potter franchise to the director of Y Tu Mamá También. Alfonso Cuarón's spellbinding third installment threw out the visual code of the first two films, opting for a hauntingly atmospheric chapter that feels more like a dark fairytale than a studio kids' movie. Cuarón took license with just about everything, from the location of Hagrid's Hut to the design of the Fat Lady portrait, even to the costumes; the kids are no longer confined to school uniforms, but walk the halls in zip-up hoodies and jeans. The director also infused the film with his native Mexican touchstones, like the sugar skulls that line the shelves of Honeydukes. Prisoner of Azkaban is an art film disguised as a Harry Potter movie, and for that it's proven divisive: cinephiles go hard for Cuarón's bold direction, while some devoted book fans gripe at the creative liberties. It's a beautiful movie that deserves every ounce of love, though it does, admittedly, have some weaknesses as an adaptation. A few key plot points go totally unexplained, like the Marauder's Map (the movie never tells us the true identity of Moody, Wormtail, Padfoot, and Prongs) or the reason why Pettigrew and Sirius have animal forms. But those blind spots don't negate the singularity of Azkaban, a movie Harry Potter fans -- and fans of franchise filmmaking in general -- should be thankful even exists, proof that filmmakers like Cuarón are worth the risk. Deathly Hallows Pt. I is the grown-up Harry Potter movie fans spent a decade anticipating. It's a sophisticated, poignant, and heartbreaking journey, the culmination of what comes before, and the perfect setup for an epic conclusion. While its other half suffers from relentless action, Pt. I is a slow and contemplative character study. 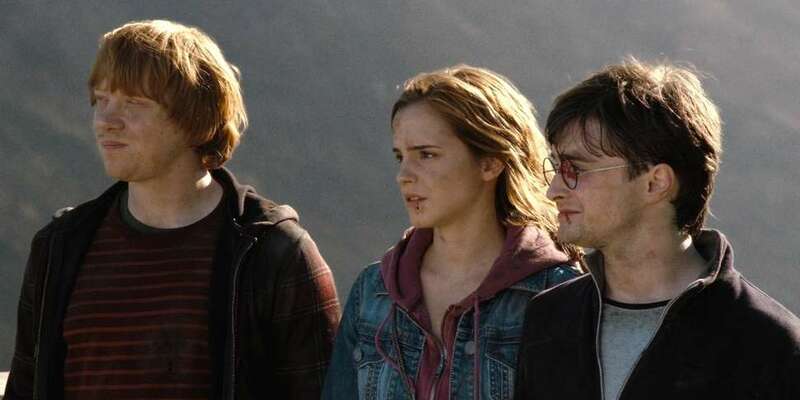 Harry, Ron, and Hermione are the beating heart of this series, and this is their best movie as a unit; isolated from society as they research and hunt for the remaining horcruxes, their friendship is put through the wringer. That tension gives way to two of the best moments in the entire franchise: Harry and Hermione's lonely tent dance, and Ron's destruction of the locket. 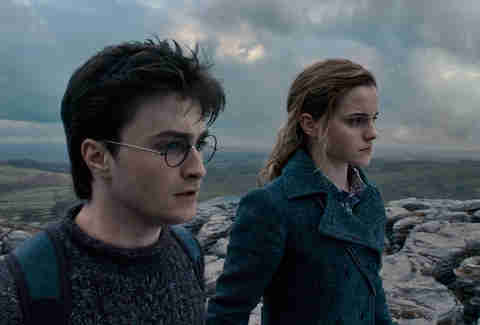 The first, set to Nick Cave's "O Children" (the only time contemporary music is used on a Potter soundtrack), is a beautiful, tender scene between two friends whose love runs complicated and deep, as they distract themselves from the open wound of Ron's absence. When he returns, he destroys the locket that attempted to destroy him, in a haunting sequence that shows the coils of dark magic and the depths of Ron's self-hatred. These kids aren't kids anymore. They're young adults combating inner demons and repressed desires. Things far scarier than Voldemort. There's so much emotional truth in Deathly Hallows Pt. I that it sometimes feels like the sequel to a totally different franchise. It's an elegant movie, with a surprise animation sequence so beautiful it takes your breath away, and an intimacy between its lead actors (Daniel Radcliffe, Emma Watson, and Rupert Grint have never been better) that shows how far we've all come together. 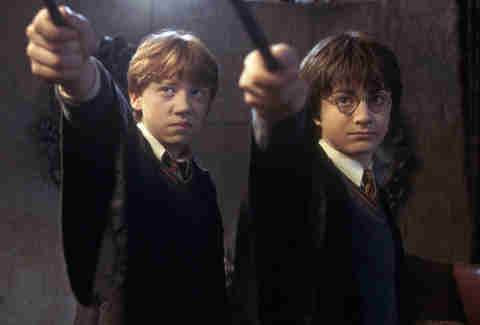 Order of the Phoenix is the longest Harry Potter book and the shortest Harry Potter movie, and that's part of why it takes the top spot on this list. It may not be the showiest, but Phoenix is a film that knows exactly what tools it needs to tell its story, and what's better left behind. A lot of that's thanks to screenwriter Michael Goldenberg: Phoenix is the only Potter film not adapted by Steve Kloves, and the difference is remarkable. Kloves' Hermione favoritism tips the scales in her favor in the other films, but Phoenix feels like a true ensemble. Luna, Ginny, Neville, Cho, Seamus, Dean, Fred, and George all get their respective due, receding from the background to stand with Harry in solidarity after Voldemort returns and Hogwarts is infiltrated by the fascist Ministry of Magic. 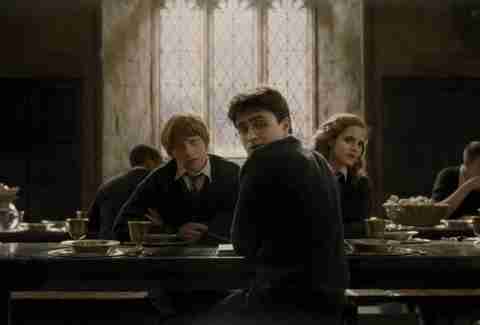 Unlike Kloves, Goldenberg understands the nuance of adolescent interaction, from the stubborn rivalry between Seamus and Harry, to the subtle glances of affection between Ron and Hermione at a Christmas dinner table. The film also has a miraculous way of balancing the book's notoriously tricky material with a deft hand. Harry's moodiness is tempered and explained, unnecessary middle chapters are done away with entirely, and the final act inside the Ministry is whittled to its primal necessity. The death of Sirius is confidently effective without being overblown, and the final showdown between Dumbledore and Voldemort is sublime -- an anticipated confrontation that's brief but enormous. But the best part of Phoenix is Imelda Staunton's Dolores Umbridge, the most horrifying Potter villain there is, including Voldemort. She's a snake in pink tweed, an advantageous xenophobe whose pure-blood privilege sees her through the ranks she'd be otherwise unqualified for. She's the Paul Ryan to Voldemort's Trump, a maniacal puppeteer of regulation and restrictive order. Phoenix balances her tyrannical rage with the solidarity of young people trapped in an oppressive institution who refuse to stay silent. It's the Potter movie with the most to say, and it says it loud and clear.